Angel Island, off the coast of California, was the port of entry for Asian immigrants to the United States between 1892 and 1940. Following the passage of legislation requiring the screening of immigrants, "the other Ellis Island" processed around one million people from Japan, China, and Korea. Drawing from memoirs, diaries, letters, and the "wall poems" discovered at the facility long after it closed, the nonfiction master Russell Freedman describes the people who came, and why; the screening process; detention and deportation; changes in immigration policy; and the eventual renaissance of Angel Island as a historic site open to visitors. Includes archival photos, source notes, bibliography, and index. * "Equally evocative and informative, this is an excellent choice for middle school libraries." * "Carefully researched and clearly written." "This is a clearly written account of a lesser-known side of American immigration history that may add to readers' understanding of current political debate." 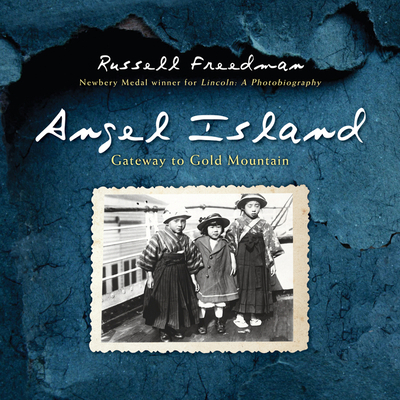 * "As immigration continues to be a major issue in America, this introduction to the Angel Island experience is overdue and, most of all, welcome." * "A thorough narrative, with personal vignettes and b&w archival photos. . . . Making this poignant account even more so are translated poems interspersed throughout, written by despairing detainees on barrack walls." "Most spreads feature one or more photographs, slightly oversized text, and generous margins, making this an appealing selection for readers who find nonfiction daunting." "Freedman’s book uses clear narrative language to pay tribute to the thousands of souls who passed through this prisonlike entryway, [Angel Island]."